Spend more time eating and less time cooking with Seaspice and Nautilus South Beach’s no-cook recipes! 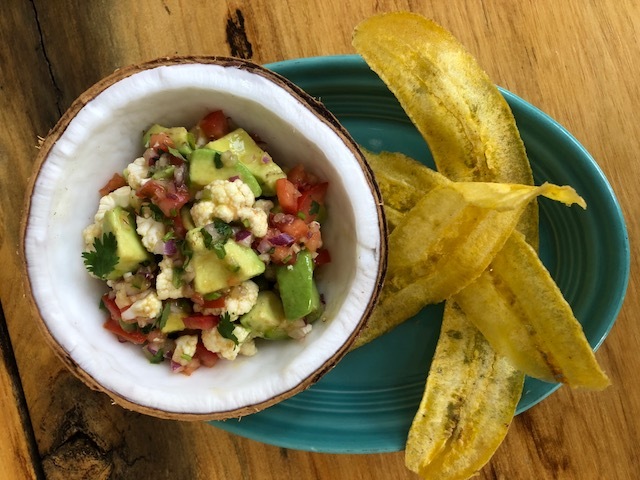 For the busy weekdays and lazy weekends, Nautilus South Beach’s Executive Chef Richard Fuentes suggests the Vegan Avocado Ceviche. In a large bowl, combine avocado, cauliflower, tomatoes, onion, jalapeno, Aji Amarillo, cilantro, lime juice, salt, and olive oil. Chop, whisk and mix to create Seaspice’s Executive Chef Angel Leon’s Florida Stone Crab Timbale, which uses red quinoa, avocado pesto, mache lettuce, and citrus Dijon vinaigrette. Whisk ingredients together in a bowl until emulsified. Place all ingredients in a blender, blend until smooth. Buy red quinoa that is pre-cooked. For those who would prefer to cook it themselves, ingredients and steps below. In a bowl, place 3.5 oz chilled cooked quinoa, add 1 tablespoon of citrus Dijon vinaigrette, ½ teaspoon salt, 1 teaspoon chopped parsley, mix together and set aside. In another bowl, place 3.5 oz of shelled stone crab meat, add 1 tablespoon citrus Dijon vinaigrette, 1 teaspoon chopped parsley and ½ teaspoon salt, mix together and set aside. In another bowl place 2 bunches of mache lettuce drizzle with extra virgin olive oil and season with salt, set aside. On the center of a plate, spoon 1 tablespoon of avocado in the center, smooth it out into a circle. Put a 4-inch ring mold on top, and place the red quinoa mix on the bottom, press down with a spoon to make it even. Then, add the stone crab mix on top, slightly press down with the spoon, carefully slide the ring mold off the plate. Top with seasoned mache lettuce and sprinkle with toasted pumpkin seeds.